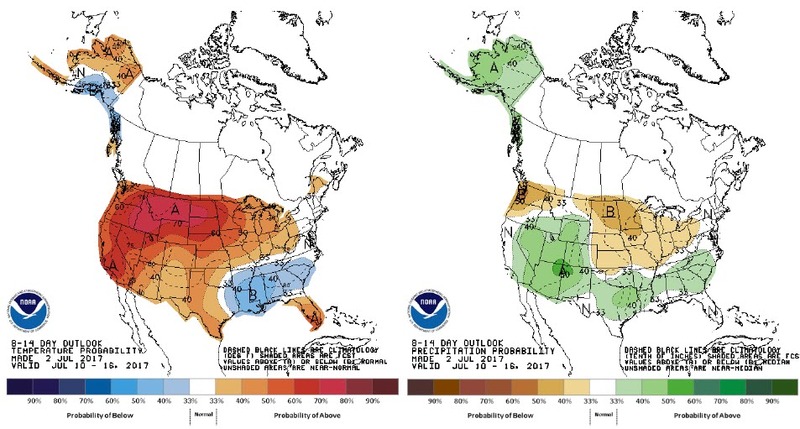 Volatility from Friday spilled over into Sunday’s overnight trade as forecasts for two weeks out look hot and dry for much of the northern Midwest. The weather market is officially “on” in my opinion. Get ready for a boat load of takes online about yield damage. Everyone will have a mid July guess and assumption about what is really going on with the crop in their neighborhood, try to not let that get in your “kitchen”, as a trader I worked with a long time ago used to say. Reports this week will be pushed back a day, in the case of crop progress/conditions we will get that on Wednesday. Other than those it will be weather and dollar watching, both of which have been supportive factors to the grain trade of late. The real news this morning is the USDA appears to have awoken the soybean bull after the report on Friday. NASS reported bean acreage at 88.7 million acres, a little higher than in March and much higher than a year ago. Bean acreage being higher is a bearish factor obviously, but it could have been higher and if you dig into the state by state report, you will notice the highest jump came from North Dakota, Minnesota and Kansas. Not the biggest players in the soybean game, not to mention 34% of the bean crop is in drought areas. The record short bean position is unwinding this morning, I look for a test of 10.00 before WASDE. Wheat remains on bid this morning after Minneapolis tested and broke 8.00 last night. Wheat conditions are going to be the headline even with the massive ending stocks number we got on Friday. 16/17 crop year is over with a carry-in number above 1 billion. It is important to not get myopic with this wheat price action. This is a gift and producers need to look at hedging strategies for next year as prices rally. The drop of US ending stocks will need supply rationing, prices rallies will not help the S/D sheet at all. Stocks to use for SRW next year will be north of 70% (70+ this year), around 40% for HRW (55% this year) and sub 20% for HSW. I highly encourage wheat producers to get some sales on if July 18 gets above 6.00. Corn is jumping to a lesser degree as the grain complex is pulling it higher. Weather in the western plains should be the driver here with over 25% of planted acreage coming west of the Missouri river. Yield conditions for corn could be worse as we get into that first WASDE report than soybeans. Conditions should remain sideways for now, but the hot dry is on its way. Stay long if you are the 390 calls I recommended. If we get above 4.00, I would look to roll the calls from 390 to 400 to get your 6 cent investment back, then ride the trade into mid-July. Unfortunately, the party at the CBOT does not include cotton. The news from the USDA should fade pretty quickly, cotton bulls need more supply news to get funds back involved. Export demand appears to be picking up, but that is somewhat of an old crop story right now. Watch the conditions reports from Texas on Wednesday, if the drop continues I think we are +70 Dec before you know it.